There was some confusion when word came that Rush’s 20th studio effort, the forthcoming Clockwork Angels, was going to be a narrative concept album. Hadn’t they done this before? What about the dystopian sci-fi epicness that is 2112? Doesn’t anyone recall all 19 minutes and 58 seconds of the search for “The Fountain of Lamneth”? Books I and II of the “Cygnus X-1 Duology” much? Ah, but there is a difference between those prior side-long sagas and the steampunk-influenced Clockwork Angels, out June 12. For the first time in their 38-year-career, bassist-singer Geddy Lee, guitarist Alex Lifeson, and drummer-lyricist Neil Peart have recorded an entire album that follows the same narrative thread — that of a young man’s journey to follow his dreams in a, yes, dystopian alternate world. But fear not, Rushians: the music that the Canadian cult-heroes’ have created to help tell this story is as crushingly virtuosic as ever. The band will be bringing Clockwork Angels on tour beginning September 7 in Manchester, New Hampshire. This is just over a year after the guys finished off their year-plus “Time Machine” tour. No rest for the prog-rock weary. 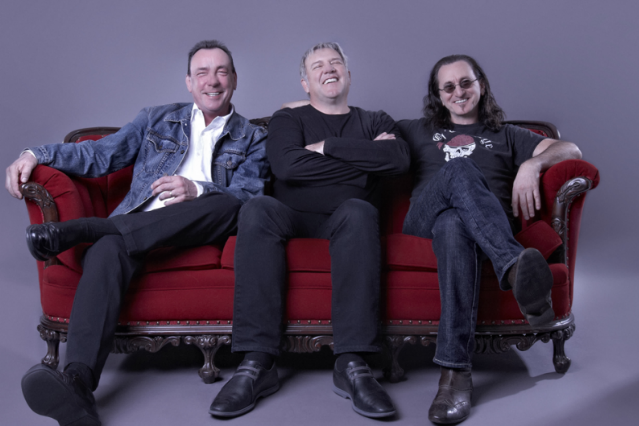 In advance of the album’s release, we spoke with Geddy Lee about the decision to go full-narrative, what surprises the band has in store for the tour, and what Rush might be doing 100 years from now. Obviously the big difference between Clockwork Angels and all the previous Rush studio albums is that the lyrics constitute a narrative. But in terms of the music, are the songs put together any differently than they’d otherwise be? Well, that’s a good question because it was much discussed while we were writing new material. The one thing that I wanted to avoid on this record was being a slave to the libretto. I didn’t want the details of the story to start weighing down the individuality of any one song. I wanted the songs to be a collection that could stand on their own, outside of context of the whole story. When you look at a collection of songs like those on the Who’s Tommy, you could pull “I’m Free” out of that and it still stands on its own. But in connection to the story, it takes on another interpretation. So there was a lot of discussion about that. I think at one point, Neil was a little frustrated with my determination to keep the story-line minimal in a sense. Was there a point in the process where Neil sat down with you and Alex and said, “Here’s what these lyrics mean”? Given that you’re the singer in the band, is there room for you to have your own interpretation? There are times where there is a lot of discussion, and there are times when we get a lyric and it’s not happening. If it’s not connecting then you gotta sit down and say [to Peart] “Yeah, tell me the story again. Why is the character in this situation? Why is he doing this? What do you want him to be feeling at this point?” Other times, it’s quite clear to me and when that happens I can bring my own interpretation into the music because I I understand what Neil wants to say and what he wants the character to be expressing. It’s really important for me to be clear with him. I have to write a vocal melody and I have to mean it, you know? So I have to be on the same page with him. Or at least in the same chapter of the book! In the press kit that accompanied the album, Neil wrote about how there was an emphasis on musical improvisation when constructing the songs. Have there been times in the past when you felt the band was being too systematic in the way it put together material? Firstly, I would say yes, improvisation was something that was on our mind due to the fact that on our last tour we allowed ourselves a few moments to stretch out and those were really exciting parts of the show. As musicians — and also for the audience — it’s not often you get to see us just let loose like that. And we are very much creatures of structure, and I think at times that’s hindered our records. You can achieve a kind of excitement live and the goal is to achieve that on the record as well, but sometimes you get so focused on the arrangement and this overdub and that overdub that you lose that spontaneous thing that can happen when three musicians are thinking together. When we were writing [Clockwork Angels] we tried to make sure we were jamming and we tried to capture some of those moments. But how does a song not start from a place of improvisation? What happens sometimes is that you lose the spark of the performance a little bit. You focus more on the notes, and what order they fall in, and building the excitement through overdubs. Sometimes that works fine — where you can multi-layer a song and add interesting things. But this time we wanted to restrict the way we used overdubs. We wanted it to be very much a three-piece record. You guys have done conceptually-driven music in the past — 2112 is the most famous example. Is there anything different about how Rush puts together concept-pieces today as opposed to how it did in 1976? It felt different this time. I think because we were taking the approach of making the songs work as individual pieces, we didn’t have to worry about the necessity for an overture or trying to bring musical themes back. That approach would’ve felt formulaic to us. The three times we attempted side-long concept pieces in the past, the music was really like one song broken up into many parts. The thread connecting the music on Clockwork Angels is the story-line. That’s the key difference. On the “Time Machine” tour that you guys finished last year, you were playing the entirety of [1981’s] Moving Pictures. This time you’ll be playing a lot of new material. Do you have to psych yourself up for the fact that fans are not going to have the same response to the songs simply on account of lack of familiarity? Are you in a different headspace going into this year’s tour? We’re very excited about doing this stuff — more so than the old stuff — but we’re not sure how much patience the audience has for it. We’re not sure how much they will dig it. I think the fact that we played two songs [from Clockwork Angels] and put them in the show [last year], and saw that there was such an immediate reaction emboldened us. It gave us confidence when we were finishing the record to think of maybe playing a big chunk of it live. Can you talk about any of the plans for the stage show? Yeah, we’re gonna expand upon the whole steampunk element that we brought on the “Time Machine Tour.” We’re gonna have fun with that whole kinda machinery and we’re designing rear-screen things and have a fun little movies. Hopefully it can all tie together in some ludicrous way. Speaking of ludicrous machines, are you gonna bring back the double-neck Rickenbacker? That’s a scary one! That Rickenbacker scares the hell out of my back. It’s so bloody heavy you have no idea. With the advances in science and modern medicine, how likely are we to see Rush playing 2112 in 2112? I would be very surprised. So you’re saying there’s a chance?